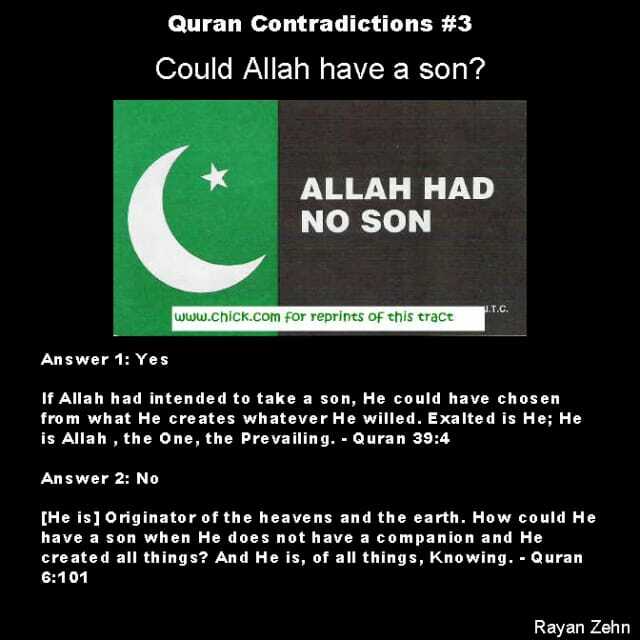 Quran says God has a Son!! Muslims reject the idea of the God of the Bible being 3 person as 1 God, primarily because they reject Jesus being the Son of God. They reject the idea that the God of the Bible can have a Son since they viewed having a son by only procreation. Muhammad never understood the relational Sonship. The Quran says Jesus is the Son of God!! The Quran says Jesus had a MIRACULOUS BIRTH!! Even the Quran witnesses to the MIRACULOUS VIRGIN BIRTH of Jesus making Him greater than Muhammad who did not. In the case of confusion, the Quran says ask the Christians!! So who are Muslims to contradict their Allah? Then again its their own Allah and prophet that has left total confusion, saying he has no son and then saying he has a son. Which is it? In the case of such outright confusion, what is the Muslim to do? Luckily the quran gives clear instructions what the Muslim is to do when in such doubt. This is a direct reference to Bible reading Christians who had the completed Bible by 70 AD, a whole 500 years before Muhammad was born. It is this Bible that has been recently proved unchanged for over 2200 years, by the discovery of the Dead Sea Scrolls. Dating back to 200 BC and when compared to the KJV was found to have a 99.994% accuracy rate. ​The Dead Sea Scrolls were found in the Wadi Qumran, 1946 and 1956 by Bedouin shepherds and a team of archeologists. They date to 3rd century BC and is confirmed by bronze coins and radiocarbon dating. This is 300 BC - 201 BC. Well before Paul or Peter could corrupt the Bible. Among the Scroll fragments was found a COMPLETE scroll of the WHOLE BOOK of Isaiah. When this was compared to the Isaiah of the KJV, it was a 99.994% match. It is now housed in Jerusalem at the Shrine of the Book at the Israel Museum.With the other more modern translations like NIV which are revisions of the KJV there is less accuracy. How can the Bible claim God is 3 persons but still 1 God?? Muslims confuse Christians for worshipping 3 gods when the Bible clearly states God is 1 god but in 3 persons (Father, Son, & Holy Spirit). How can this Trinity be? How can this 3 DISTINCT persons still amount to ONE god? Simple. Muslims see trinities and even more than that as one on a daily basis. Lets take the you waking up this morning. If you are like most people you awoke in a room of some kind. So as you can see your everyday room is trinity if not more. So should we be surprised when the almighty God of Israel (Yahweh) says He is a Trinity (3=1), with God the Son being Jesus Christ, the son of Mary? The Bible calls Jesus the WORD of God, that took on flesh to dwell among us. Your own voice is still considered a part of you. So why isn't it the same with God whom we are in the image of. The Christian and the Bible says Jesus is the Son of God!! This Bible testifies that Jesus Christ is the Messiah(just like the quran does) sent by God to pay a substitutional death on the cross for all who BELIEVE on Him as the Son of God. The Bible also testifies from multiple writers that God (in a booming voice from Heaven) [Matt3:17], Jesus Himself [John10:36], the prophet John the Baptist [John3:36], the angel Gabriel [Matt8:28-30], and even Demons called Jesus the Son of God [Matt8:28-30]. The Demons not only called Jesus the Son of God but also ran from afar and WORSHIPPED Jesus as God [Mark5:2-7]. Who is the Muslim to contradict what even the quran says is true. Both the Bible and the Quran says Jesus is not only the Son of God but also the Messiah sent by God. This means Jesus is the ONLY way sent by God to take away the sins of the world of everyone. This is something neither Muhammad nor a martyr can do. Only THE Messiah can be a substitute for others because only the Son of God can be PERFECT like the Bible says He is. In fact the Quran says Muhammad was NOT perfect, which is why he can't be take on anyone sins. Won't you accept the Jesus whom even the prophets called "The Lamb of God who take away the sins of the world" [John1:29] and be saved from God's wrath against all sins? This way you are assured Heaven something even the Quran says good works can't assure you.